The author of Suzanne and the translator, Rhonda Mullins, speak about their collaboration and the universality of one grandmother's story. 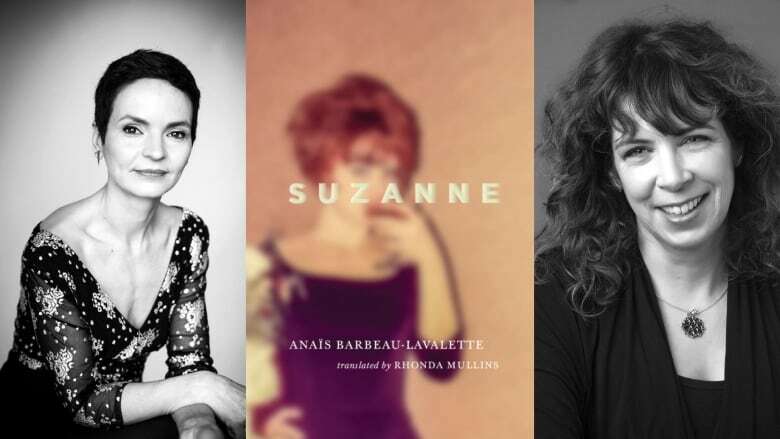 Suzanne by Anaïs Barbeau-Lavalette was first published as La femme qui fuit in French in 2015 and was translated into English by Rhonda Mullins in 2017. The novel gives an imagined account of the life of Barbeau-Lavalette's estranged grandmother, Québécois poet and painter Suzanne Meloche, who abandoned her children as a young woman. Although the novel is fiction, it draws from Meloche's lived experience — as unearthed by painstaking research Barbeau-Lavalette conducted, with help from a professional investigator. Suzanne will be defended by Yanic Truesdale on Canada Reads 2019. The 2019 debates are happening March 25-28, 2019 and will be hosted by Ali Hassan. CBC Books spoke to Barbeau-Lavalette and Mullins about collaborating on Suzanne. Anaïs Barbeau-Lavalette: "For a long time, I never really had an interest in my grandmother. I knew that she had left my mom and I knew that was something hurtful in our family. But then she died, and I was in her apartment and that's when I first realized that she was more than someone who had left. She was a woman — complete and complex. I knew it was to be up to me to go after her. Sometimes you have to jump a generation away from the wound. At the same time, I was pregnant with my third child, my first girl. So the book is linked to a death and also to a birth." Barbeau-Lavalette: "At the beginning I tried to collect what I could, but [Suzanne] was very secretive. She didn't leave a lot of footprints. I went to her friends, to her lovers and I read her letters, but I realized there were so many holes that I needed a professional to help me go after her. The woman I worked with is not from the literary world; she's a detective. She used to go after serial killers — the ones who don't leave any trace. She was perfect for this because she became really obsessed with the ghost of my grandmother. This work drew a whole human being for me. She stopped being a ghost." Rhonda Mullins: "[Translating Suzanne] was highly educational for me. Quebec history as I knew it was sort of the Duplessis years and the Quiet Revolution. And this period — this in-between time — was something I didn't know very much about at all. I enjoyed doing background reading on that, and then also going to see these artists' works and sort of piecing together a history of Quebec through its artists, which was so fascinating for me." Barbeau-Lavalette: "This part of our history is covered in the books we have at school, but it's very boring. But when you put it into human terms, it's different. You realize these were 20-year-olds who needed to believe in the future, to believe in their dreams, to live. And when we put the face of the youth on this [period], we recognize ourselves in them. I've been going to a lot of schools to talk about the book and there are young people from all over the world who feel really connected to people like Paul-Émile Borduas. It's not only about the history of the territory; it's about human impulses." Mullins: "I was struck by two things about this book. First of all, it's in the second person and second of all, it's got short sentences. Going in, I was a little bit concerned about how the second person would come across in English, but I found it went fairly seamlessly. The short sentences, meanwhile, I thought would make the translation easy. But it turns out that when you've got short sentences, every word counts! I also felt the weight of [following] the French version, because Quebeckers love this book so much. There was so much affection for it that I was getting stopped on the street after I'd done the translation by people who wanted to talk to me about the book." Barbeau-Lavalette: "It was the first time that my work had been translated. And it's such an intimate novel. It was an exercise in vulnerability to share my voice — to share these words — with Rhonda. But I felt she was an auteur. I felt her care with the words. That she was aware of their rhythm. Not just what each word means, but how it's supposed to make you feel. It was so important to me to know that she would translate the heart and the guts of the story." Barbeau-Lavalette: "When I was writing this book, I thought it would only be interesting for me, my mother and maybe my kids. It's not something I thought people would read in a way that would be connected to the period that we're in. But I think we all share this paradox between our roots and our liberty. We need to be connected to others and to be faithful. But at the same time, we need to be free and fulfil our dreams. That's something we all fight with. "When I began to write, I didn't have the link I have now with my grandmother. It was not something I could have foreseen. What is beautiful — more than beautiful, magical — is that at the end I came to a place of forgiveness. I was able to reflect on what she gave me with her absence. It became clear to me that I would not be the same without this inheritance. And now I feel free. I have three kids and we're trying to create this contemporary invention: how to be free and at the same time, how to cultivate the links and the love that we have for our kids, our friends, our lovers. For my kids now, the story has been repaired. What is beautiful is that other people now — with this book — are repairing their stories." Anaïs Barbeau-Lavalette and Rhonda Mullins's comments have been edited and condensed.